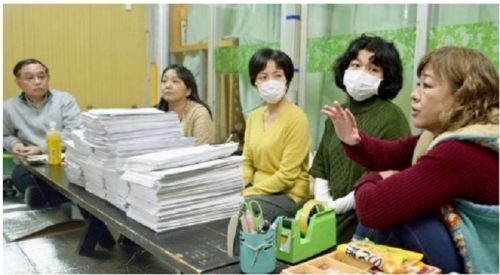 Following the incident where parts fell from an U.S. military aircraft, 100,456 signatures were collected by January 31 by the Midorigaoka Nursery’s Parents’ Association. The petition called for the suspension of flights by U.S. military aircrafts above the nursery. The parents’ association set the deadline for the petition and tallied the signatures on the same day. The signatures were collected over 52 days. The plan is for the parents’ association to travel to Tokyo on February 13 and 14 to hand the petition to the proper government agencies. The petition also calls for the investigation into the cause of the parts falling and the suspension of flights by U.S. military aircrafts until the cause is determined. The goal at the start of the petition was only 10-thousand signatures. Tallying up the signatures took from 2 p.m. to the evening. About 20 parents participated in the tallying during their spare time outside of work. The parents shouted with joy when they reached the 100-thousandth signature. Even while the parents were busy tallying the signatures, U.S. military aircrafts were flying above the nursery. Parents’ Association President Tomoko Miyagi, 48, appreciated everyone’s effort. She said, “When we first began this petition, we weren’t expecting to collect these many signatures. Every day, we received signed forms and letters. During their visit to Tokyo, the parents’ association plans to submit the petition to the Ministry of Defense, Ministry of Foreign Affairs, and Cabinet Office. They plan to hold a press conference at a Lower House meeting in which they will invite Diet members. The parents plan to contact the Diet members individually to request their presence at the Lower House meeting. They also plan to hold another press conference at the Foreign Correspondents’ Club of Japan. Parents’ Association Secretary Chiemi Yonagusuku, 44, who proposed the petition, was determined. She said, “We will take everyone’s hopes to Tokyo.